Do You Call This A Life? Gerbert van Loenen is a Dutch journalist. Former German correspondent for the Amsterdam daily Trouw, he was deputy editor-in-chief for that paper until 2014. What are the origins of a judgment like this? van Loenen investigates the legal, medical and cultural influence of the Netherlands’ euthanasia practice. This important analysis connects North America’s future with Holland’s euthanasia experience. Please click one of the buttons below or call 519-439-3348 or 1-877-439-3348 or e-mail: info@epcc.ca. Please note: to get the combined discounted price ($25 for both the book and DVD), contact or e-mail us as above. What do you want to do when you leave school? A casual conversation starter I think I’ve probably had with each of my children at some point – even repeatedly. It had an additional context when I raised it with Joseph recently in a quiet moment. Joseph, in his fourteen years had had probably more prospective careers than most of us could think of; ranging from a long period when he was convinced he would be a priest to only recently wanting to ‘go into business’ operating a pizzeria out of our kitchen (Mum had other ideas!). Okay! I know! That sounds like a harsh response, but it’s not. Joseph and I have great conversations about all sorts of things. Anne and I are also as firmly committed to providing him with the very best educational and emotional platform we can. But we’ve done that for all our children, so that’s hardly surprising, even if fleshing that out requires somewhat a different approach from the others. The question of disability is a consistent theme throughout Gerbert van Loenen’s book: Do You Call this a Life? 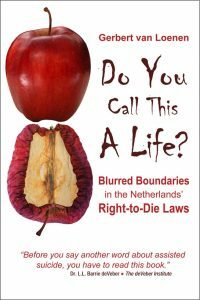 Blurred Boundaries in the Netherlands’ Right-to-Die Laws. Ostensibly chronicling and analysing the history and progression of the Dutch affair with euthanasia, van Loenen’s crisp prose refers constantly to the changing and challenging of concepts in Dutch academia and politics in relation to the worth of human life. In summary: once human life is valued only in subjective terms of relative merit or worth, there is an inexorable extension of application, in terms of euthanasia laws, from a limited cohort to almost anyone. It is unfortunately all too common an experience of those living with disabilities and their families that there will have been occasions when the kind of subjective evaluation: “I would rather be dead than…” raises its ugly head. The Dutch are not alone here. But what the Dutch and the Belgians have effectively done with their respective euthanasia laws is enshrine the ‘Life Unworthy of Life’ principle in both law and practice in respect to the most grave of matters: life and death. (Dutch) Ethicist Hans Reinders describes how the physicians’ views on what makes life valuable may influence how they deal with their patients. Physicians and caregivers might believe that the valuable life consists in each individual developing into something greater. Writing about the care of people with mental disabilities, Reinders noted the tendency of caregivers to want these dependent individuals to develop, even the severely handicapped ones. If caregivers apply this way of thinking, it implies that the treatment must help the disabled individual improve. The Dutch and Belgians have comprehensively failed to make the distinction between human potential and the intrinsic dignity of the human person; What does not become something, is nothing. Indeed. Even the idea of ‘development and independence’ here is tainted because such development is not seen as a good end in itself but rather an expectation placed upon an individual by these societies, for membership. Of course Anne and I want Joseph to experience the ‘goods’ of life to the greatest extent possible; but not because access, equity and achievement provide a justification for his existence! van Loenen, an academic, writer and editor, presents us with a compelling and well written look at the history and experience of the ‘Dutch experiment’ that serves as a necessary warning to other jurisdictions. As Dutch Professor Theo Boer recently warned: ‘Don’t go there’. Our thanks, too, to the publisher for this first translation from the original Dutch text. Many outside Holland will be aware of the markers on the progress of the ‘Dutch experiment’ but few, including this writer, will have previously had access to the breadth of activity and academic complicity that developed over the period prior to the law in 2001 and then beyond. van Loenen marks the beginning of the Dutch flirtation with euthanasia as the publishing of a book, Medische macht en medische ethiek [Medical power and medical ethics] in 1969. The author, physician and scientist Jan Hendrik van den Berg, says Van Loenen, started the Netherlands thinking about the sense and nonsense of medical action. The point Van den Berg tried to make in 1969 was that a distinction should be made between meaningful and meaningless life, says van Loenen. Deference to ‘experts,’ including deference by ‘experts’ to other ‘experts,’ is dangerous. Allowing ethical considerations regarding life and death to be linked to the interests of the ‘social organism’ (society or the state) is dangerous. Believing that there is one set of moral principles for the ‘individual’ and another set for the ‘social organism’ is dangerous. Behaving as though ideas – even grotesque, inhuman, ideas – can be carefully considered for their relative merits as though they have no consequences or implications is dangerous.